As President Trump asks Congress to cut DOT funding for the remainder of FY 2017 and in the “skinny budget” for FY 2018, APTA recently issued a Legislative Alert to its members urging them to contact Congress to support the Capital Investment Grant Program as deadlines for formal appropriations requests approach. “We are asking you to contact your Senators and Representatives and urge them to support public transportation by signing on to the appropriations request letters,” the alert stated, noting links to the request letters. “The deadlines for formal appropriations requests for members of the House of Representatives is April 4th, and the deadline for Senators is April 6th. Given the threat posed by the president’s proposed budget, please ask your elected officials to sign these letters and also make a formal request of the Appropriations Committees in support of public transportation program,” the alert stated. APTA worked closely with both Congress and stakeholders to develop the letters and the association continues to meet with key members of Congress to protect public transportation finding. The Senate Committee on Commerce, Science, and Transportation held a nomination hearing March 29 for Jeffrey A. Rosen, President Trump's nominee for deputy secretary of transportation. Rosen was DOT general counsel from 2003-2006 and general counsel and senior policy advisor to the Office of Management and Budget from 2006-2009. He also has been a member of the law firm Kirkland & Ellis. 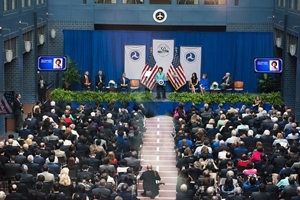 DOT Secretary Elaine L. Chao referenced President Trump’s proposed $1 trillion investment in infrastructure during a March 29 event commemorating the department's 50th anniversary. She said details will be released later this year and will include “energy, water and potentially broadband and veterans’ hospitals” as well as transportation infrastructure. “Common-sense regulatory, administrative, organizational and policy changes ... will encourage investment and speed project delivery,” Chao said. Also participating in the event were Rep. Bill Shuster (R-PA), chairman, House Transportation & Infrastructure Committee; Virginia Gov. Terry McAuliffe; Michael Sacco, president, Seafarers International Union of North America/AFL-CIO; former DOT Secretary and U.S. Sen. Elizabeth Dole (R-NC); and U.S. Senate Majority Leader Mitch McConnell (R-KY). U.S. Sen. John Thune (R-SD), chairman of the Senate Commerce Committee, delivered the opening remarks. FTA has announced that two recently finalized guidance documents took effect March 21. The Award Management Requirements (Final Circular) is intended to help public transit agencies administer FTA-funded projects and meet award responsibilities and reporting requirements. The Buy America Handbook is intended to help public transportation agencies, auditors, rolling stock manufacturers, subcontractors and suppliers understand and apply FTA’s pre-award and post-delivery audit requirements for rolling stock purchases. Both documents had been scheduled to become effective Feb. 13; however, on Jan. 24, President Trump directed all agencies to postpone for 60 days implementing any final regulations that had not yet taken effect. FTA subsequently issued its own clarifying memo to include guidance documents. • FTA's Safety Operation Plan for Tier III Passenger Equipment. The APTA CEO Search Task Force Working Group One encourages you to provide your comments on the key attributes and qualifications for APTA’s next President and CEO. This feedback will be incorporated into the job description and recruitment process. Please fill out the online survey by April 7 or contact Gregg Moser at Krauthamer and Associates. The APTA Bus & Paratransit Conference in Reno is only a month away! Register here to make sure you'll be there for the latest and most relevant speakers, panel discussions and educational sessions. Pushing Back: APTA Acting President & CEO Richard White called President Trump’s proposed FY 2018 budget for infrastructure investment “inconsistent” with campaign remarks in a New York Times article quoting industry experts. Experienced Influencer: USA Today talked with DOT Secretary Elaine L. Chao, the only member of President Trump’s Cabinet to have previously served in that body, about priorities, politics, and policies in her first interview since being confirmed. ‘Doing the Right Thing’: A bus operator for the Jacksonville (FL) Transportation Authority stopped his bus to help an elderly passenger, an act of kindness photographed by a passing local TV reporter. See the story and follow-up video here. Moving Force: This five-minute video from FTA describes the vital role public transportation plays in a growing economy and improved quality of life for millions.